Today in Perugia, the appeal of Amanda Knox and Raffaele Sollecito against their conviction for the 2007 murder of Meredith Kercher entered its final stages as the prosecution began to sum up its case. In the main, what they had to say seems to be just as might be expected. For them, all the evidence overwhelmingly points to the fact that the pair are – wait for it – guilty. First of all, Knox has no credible excuse for attempting to pin the crime on her ex-boss Partrick Lumumba. And the fact that he was present in court today can only have served to underline that inexcusability. What’s more, somebody tried to stage a burglary at the crime scene, and there is simply no-one other than Knox and Sollecito who could have had any reason to do that. In spite of criticisms of key pieces of DNA evidence in the case, the science remains sound. 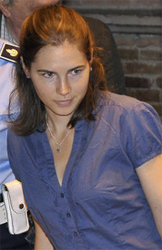 Knox killed Meredith Kercher with a knife belonging to Sollecito and Sollecito removed Kercher’s bra after she had died. Even if there were any doubt about that, at the crime scene their footprints were found in the victims blood at the crime scene, and Knox’s DNA was found intermingled with same blood. And the defence version of events – that Knox spent the evening of the murder at Sollecito’s flat, where they got up late the next day – is contradicted by the records provided by Sollecito’s ISP, not to mention two witnesses who saw them in the vicinity of the flat during that period and who – despite the suggestions of the defence to the contrary – both gave reliable testimony. Reports from Perugia seem to suggest that all this was fairly effective in its presentation. And, of course, it’s an important function of closing arguments that they serve to remind the court of the most salient details of the case and to outline the shape of the prosecution and defence arguments. But, slightly add odds with the way things might work elsewhere in the world, the judges and juror-judges in this case were empanelled ten months ago and have had all that time to digest reams of sentencing reports, trial transcripts and technical documents. By this stage, their impressions of the evidence, whatever those may be, are likely to be fairly settled and there’s no much that the prosecution – or, by the same token, the defence – will be able to tell them they didn’t already know. And it’s equally unlikely that any new perspective on the evidence can radically affect the outcome of the trial. And so, the most significant part of what prosecutors had to say today (or, at least, the most widely reported) was more to do with the psychology of the courtroom. For some time now the bench has been its (rather occasional) court sessions looking out at the faces of the two defendants. For better or worse, there must by now be a fairly intimate relationship between Knox, Sollecito and the eight people who will decide their fates within the next couple of weeks. And the appellants don’t necessarily look like bad people. They are someone’s son, someone’s daughter. And, judging by their recent appearances in court, Knox in particular seems to be suffering from the strain of it all. It might be inferred from today’s proceedings that the prosecution are concerned that a factor in their disfavour, not written in witness statements or DNA printouts, is the impact of basic human pity. Prosecutor Giancarlo Costagliola bemoaned media coverage of the case which, he said, made everyone “feel like the parents of Sollecito and Knox” and urged the bench to put themselves instead in the shoes of the victim’s parents. That seems to have been the key message of the first day of closing argument, and it wasn’t put subtly. Just prior to the court going into private session to view images of her wounds, Costagliola’s colleague Giuliano Mignini recalled looking into Kercher’s eyes at the crime scene. Later, he discussed the public relations efforts made on behalf of his quarry, alluding without apparent reservation to Joseph Goebbels. “Slander, slander, slander” is how he characterised it. And anyone familiar with the case extra curiam will be aware that he feels himself to have been among the targets of such. It can’t be doubted that this was not a timid performance. And, at the end of proceedings, a more-or-less direct attack on the morality of the defence case: “Don’t let the black guy pay the whole price for this murder”. It’s probably not a bad line to play, since the advice is so clearly correct. The defence are hardly going to come back with a plea for the court to ignore the evidence and focus on press speculation. And, with members of the Kercher family reported to be intending to be there for the defence summary next week, the prosecution must be hoping to usher in a change in the emotional dynamic of the courtroom. But, even if the prosecution have succeeded today in getting their message across today, the case will still hang on what the Sphinx-like judges have actually made of the evidence. Those dice are probably cast already. Knox/Sollecito DNA battle – who won? As courtroom debates over DNA draw to a close, tweets and early reports from English language journalists in Perugia covey a mood that things are going in the defence’s favour in the appeal of Amanda Knox and Raffaele Sollecito against their convictions for the 2007 murder of British student Meredith Kercher. Maybe there’s some basis for this, but I’m unconvinced. One possible reason for taking such a view might be a misreading of the thing that’s hogged the limelight in reporting over the last 48 hours. Yesterday, prosecution expert Giuseppe Novelli criticised Carla Vecchiotti and Stefano Conti, the scientists who conducted a review of DNA evidence, for their decision not conduct a full re-test with regard to the kitchen knife alleged to have been used in the murder. According to Novelli, this could have and should have been done. It was an inexplicably missed chance to confirm the validity of the original testing. Today in court, the prosecution formally requested further testing of the knife, but the request was declined. My impression is that some have taken this as a significant clue as to the thinking of presiding judge Claudio Pratillo Hellmann. But I don’t think it is. Whatever is between his ears, he was never going to accede to the request. Knox’s lawyer Luciano Ghirga objected in court that holding a second review of DNA evidence is virtually unheard of, and I don’t doubt that this is correct. And re-testing wouldn’t have had much value in any case. If it had failed to find the DNA, that would not have excluded the possibility that there was DNA there at some point. And if it had found the DNA, that would not have excluded the possibility that it got there by contamination, as the defence have argued. The prosecution were sensible not to miss an opportunity to demonstrate with intent how confident they are about the validity of the evidence, safe in the knowledge that their bluff was never going to be called. But the inevitable rebuff means nothing. It’s not easy to predict what the bench will end up making of the DNA evidence overall. That’s partly because the answers they are looking for are in the boring technical detail gone over by the experts in court, much of it obscure and most of it unreported. But, with regard to the knife, assuming they follow the explanations of the science they have heard in court, I don’t think the judges have much option but to accept that it is valid evidence. Six weeks ago, it was another story. The possibility that the knife was contaminated was the ace in the defence’s hand. The DNA review said it was possible and it was not easy to see how any reasonable scientist could disagree. The quantity of Kercher’s DNA found was tiny and, unless everything was done extremely carefully, a tiny amount of DNA in a test can be the result of contamination. There was never a real chance that this contamination could have occurred during the recovery of the knife, because this had happened at Sollecito’s flat, where Kercher had never been, and there is no good reason to think that her DNA might have been there. But the DNA review reported a lack of detailed information about how tests were conducted in the lab. So, unless the prosecution were able meet the burden of showing that everything in the lab was hunky dory, prudence dictated that the possibility of contamination there could not be ruled out. That picture flipped in testimony on 30th July, when one of the authors of the DNA review, Carla Vecchiotti, was asked about the difference it might make if it could be shown that no material relating to the Kercher case had been tested in the lab during the six days prior to the testing of the knife. That could rule out the possibility of any of Kercher’s DNA being present in the lab in order to contaminate the knife. Vecchiotti said that six days was long enough for this to be the case. Perhaps tellingly, the defence don’t seem to have put forward any counter-argument to this. Which means that the defence case with regard to the knife is effectively reduced to the proposition that the DNA sample was too small and some of the peaks in the printouts were below 50 RFU in height. It is what is sometimes referred to as “low copy number” DNA. But the argument is weak without the possibility of explaining a consequent risk. There’s no doubt that the sample is a match to Kercher and if there’s no possibility of contamination, who cares how small the sample was? And why should they? This line of defence seems to amount a plea to turn back the scientific clock. As DNA analysis has improved, it has become routine around the world (with the notable exception, until recently, of the US) for convictions to be based on tiny quantities of DNA. It happened in the Anna Lindh case, the Peter Falconio case and, in the UK, over 500 cold cases have been reopened using low copy number DNA evidence. The judges in the Kercher case ought really to treat the idea that the sample is too small in the same way they would treat a plea for a speeding ticket to be thrown out because it was printed in 6-point font. Arguments regarding the clasp from Kercher’s bra, said to have had Sollecito’s DNA on it, appear slightly more finely balanced. The same principle as in the case of the knife would appear to rule out the possibility of contamination in the lab. But the judges fact a genuine dilemma when they consider the possibility of contamination at the scene of the crime. The prosecution point out that Sollecito’s DNA was only found in one other place in the flat, so it’s not as if the place was swimming in it. And there’s no real reason for it to be found in Kercher’s bedroom, which is where the clasp was recovered from. But, whilst it may be true that the chances are not high, the question for the judges is how high do they need to be? That’s very subjective. They’ve been played a DVD showing various alleged breaches of protocol by investigators in handling evidence, such as failing to wear the right protective clothing and putting some of the evidence into plastic bags rather than paper ones. They also have to consider that the clasp moved across the floor of the bedroom between its discovery and its eventual bagging over a month later, by some means that has not been accounted for. These things don’t necessarily carry with them a huge increase to the risk of contamination. But the judges might just feel that the risk doesn’t need to be huge to be significant. It also has to be acknowledged that, whereas there remains a considerable amount of evidence against Knox with or without the knife, the clasp is a fairly big part of the case against Sollecito. I don’t think he’s likely to walk free, but maybe it isn’t unimaginable. And it seems that lead prosecutor Manuela Comodi has enough imagination to conceive of the possibility that the case may not go her way. On the one hand, this only seems like stating the obvious. But something seems wrong with any picture than involves a lawyer being candid with journalists. Closing arguments begin on 23rd September. Today’s court session in the appeal of Amanda Knox and Raffaele Sollectio doesn’t seem to have put any real dynamite under anything, but it does seem to have been interesting for a few reasons. First there was a discussion about documentation of negative controls carried out on the items of DNA evidence currently the subject of contention. The controls are significant, because a lack of evidence of them was cited as increasing the risk of contamination of the evidence in the lab, in a scientific report by court-appointed experts Carla Vecchiotti and Stefano Conti. The significance of these documents may be somewhat reduced now, since Vecchiotti has conceded that the chances of lab contamination are, after all, not high, because of length of time between the testing of the disputed evidence and any prior testing of other evidence related to the case. According to the prosecution, the documents were filed way back in 2008 and Conti and Vecchiotti ought to have been able to take them into consideration, it’s just that they didn’t. The defence argue that the documents were not re-filed for the appeal and that it is too late to seek their admission now. Judge Hellmann decided not to decide, and instead deferred the matter. Presumably, he will ask for the documents if he thinks they still matter at the end of the current courtroom debate. Most of the morning session was given over to a further cross-examination of Carla Vecchiotti, this time by Fransceso Maresca, counsel for the Kercher family. 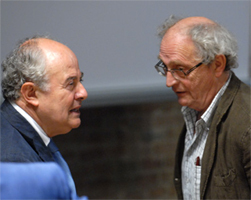 It seems to have been fairly important to Maresca’s strategy to depict Vecchiotti and her collaborator Conti as having submitted a report which criticised not just the evidence in the case, but DNA evidence in general. Of course, that’s something no court could stand for, so it’s probably not a bad strategy to go for if you think you can pull it off. It’s not really an entirely fair allegation, in my view. The central thread of the DNA report, that there were reasons to worry about the possibility that evidence may have been tainted by contamination, was reasonable. It’s a thesis that now seems in danger of corroding like an unattended metal hook, but it was right to raise it. Vecchiotti’s vice is to not want this to happen and that seems to be something that Maresca preyed on in court today, as she strayed away from sound science and onto riskier, less convincing ground. The best example of this was her suggestion that elements of her own DNA and even (oh, the theatre!) that of Judge Hellmann, in all probability, could be discerned in the DNA printout attributed as a mixture of the DNA of Raffaele Sollecito and Meredith Kercher. Undoubtedly, that seemed to her like a good way of getting a point across. But it isn’t science, it’s rhetoric and misdirection. As I tried to show in this post, the thing about a mixed sample is that you can usually find indications of anyone’s DNA in the printout if you really want to and you don’t know what you’re doing. I know that, because I really wanted to find Casey Anthony’s DNA in the printout we’re talking about. I didn’t know what I was doing and – hey presto! – I found it. Sort of. What I couldn’t un-find, though, was every single one of Kercher’s peaks and every single one of Sollecito’s peaks, right there, plain as day. In case you don’t get the point, write out the names MEREDITH KERCHER and RAFFAELE SOLLECITO on a sheet of paper. You will see that every letter of CARLA VECCHIOTTI is there, except for the V and one of the Cs. But that doesn’t mean her name is there. To put it yet another way, elements of Vecchiotti’s profile, as well as elements of Hellmann’s, probably can be seen in the Kercher/Sollecito DNA printout. But that would be true of most prinouts from a mixed DNA sample. Vecchiotti has fallen into doing exactly what Maresca is accusing her of. She’s slipped from critiquing the evidence into a low-brow critique of forensic science in general. So, Vecchotti’s claims in this regard are not only meaningless, they’re also disingenuous. It’s a big problem for her credibility if that’s as obvious to the bench as it is to me. And if it isn’t now, it will be at some point, because she has provided team Maresca with a singularly memorable exchange to be recalled and lambasted later in the process. Be sure of it. On the question of the presence of Kercher’s DNA on the blade of the knife, Vecchiotti repeated the line she reluctantly gave at the last hearing before the summer break. Yes, it’s a match, you could say, but it is from a very small amount of DNA and therefore not reliable. Again, I think this is going to look like obfuscation to the judges. But only because it is. What Vecchiotti isn’t able to clarify is in what way a small amount of DNA is not reliable. From a scientific point of view, it could give rise the possibility of a false positive through contamination. But we already knew about that. Or it could give rise to “stochastic effects”, false or missing DNA peaks. But it can be seen just by looking at the DNA printouts that no such things are present. They just contain Kercher’s peaks. Again, clear as day. I don’t think she’s fooling anyone. But it’s the fact that she is trying to that is most damaging for the defence. You could say that her point-of-view appears to small to be reliable. In the afternoon, Patrizia Stefanoni, lead scientist in the original investigation, was, in contrast, softballed the questions by prosecution lawyer Manuela Comodi. But first she gave a presentation explaining why Conti and Vecchiotti were wrong and she was right. The detail of that presentation probably will be considered important by the judges. Unfortunately, I don’t know what those details were, so I can’t enlighten you much. Under questioning, she explained how good the procedures in her lab were (they handled samples from behind a glass screen, apparently) and how Conti and Vecchiotti had failed to take into account how standards had changed between then and now. How can she have been expected to perform to standards that had not been set at the time? How can she be expected to have acted in the way she might do with test kits that were not yet on the market? She admitted that plastic evidence bags were used at the crime scene after investigators ran out of paper envelopes. And there seem to have been one or two interesting new facts. Did you know they used the household fridge at the flat for storing evidence before moving it on? But that was the easy part for her. Tomorrow, she will face questioning from the defence. A lot of reports today have focused on a letter written to the court by Meredith Kercher’s sister, Stephanie. I don’t have much to say about that, other than that this report is the one that seems to quote from it most extensively. You are currently browsing the maundygregory blog archives for September, 2011.